Harold van Es is a Professor of Soil and Water Management and former Chair of the Department of Crop and Soil Sciences at Cornell University. Phil Frost is a Ph.D. student in Crop and Soil Sciences and a TCi Scholar. Phil Frost (left) and Harold van Es (right) discuss principles of soil health with partners and community members. In the past year, the concept of soil health has gained a lot of interest in India. The Government of India has launched a major initiative to collect soil samples from farms, analyze them in laboratories, and provide the results to farmers in the form of a soil health card. This of course is a monumental task as there are so many farms and small fields in the country, and the logistics of having millions of soil samples analyzed is daunting. But the good news is that the government recognizes the importance of soils as the foundation of agriculture and nutrition. Thus far, the government interprets the concept of soil health as relating mostly to the nutrient status of the soil. Nutrients are a critical component of soil health, but we regard it as a broader concept that also includes the physical and biological functions of the soil. With the many advances associated with the Green Revolution, Indian agriculture has become more reliant on chemical inputs to achieve high yields with the enhanced crop genetics. But we are now seeing crop production being constrained by more complex biological and physical processes that need our attention. The Tata-Cornell Initiative includes a project on soil health that involves several researchers, including the two of us (Harold van Es is a Professor of Soil and Water Management. Phil Frost is a PhD student funded by TCi), and Adjunct Professors Peter Hobbs and David Rossiter. We are building heavily on the soil health assessment and management framework that was developed at Cornell University. Since we started this effort in the early 2000’s, soil health has become a major U.S. and international focus. We have learned much about the importance of soils as a biological system, and how management practices can enhance the functioning of the soil. 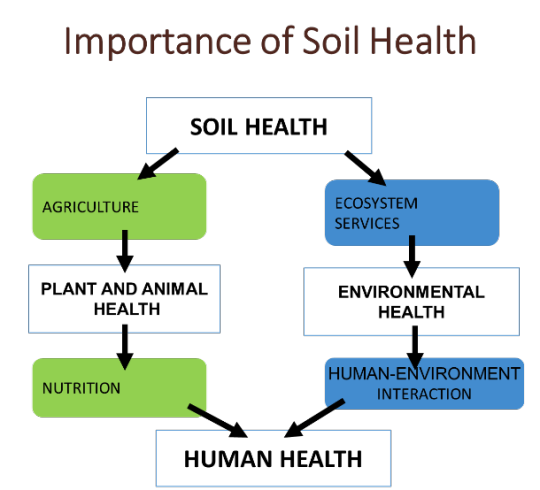 The picture below conceptually explains the importance of soil health to human health through two tracks: enhancing agricultural productivity and nutrition, and through its impact on ecosystem services and environmental health. When soils function well, there is better water and nutrient retention, less flooding, less greenhouse gas emissions and other environmental impacts that also influence the quality of life for farmers. Our TCi soil health project is off to a good start. We have established relationships with institutions like Bisra Agricultural University (BAU) in Ranchi (Jharkhand), CIMMYT, PRADAN, the Borlaug Institute for South Asia (BISA), and even a large private fertilizer company (Indo Gulf). We believe that it is important to work with both public institutions, NGOs and private companies. During our January 2016 visit, we offered a soil health workshop at BAU (see picture below) that was very successful. It greatly enhanced people’s understanding of soil health and the framework that we have developed at Cornell University. 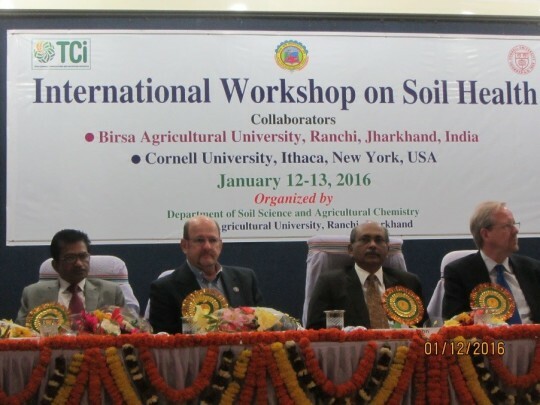 First International Workshop on Soil Health, hosted at Birsa Agricultural University in Ranchi, Jharkhand. 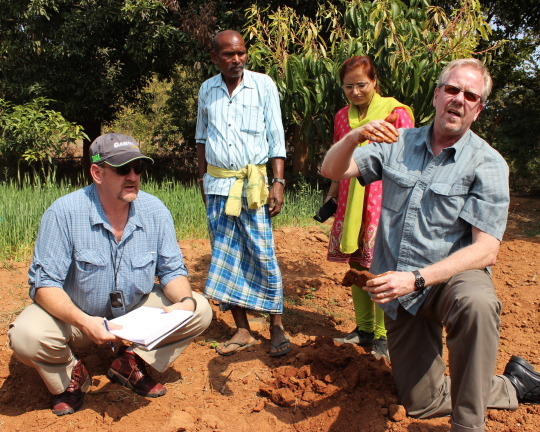 As part of Phil’s PhD research, we have been able to make preliminary assessments of soil health on Jharkhand farms. This helps us understand the status of soil health in the region, and can guide management approaches to regenerate the soils. During our trip, we also visited farms and research stations to better understand soil constraints to crop productivity. We were struck by the poor soil health status of many fields, but were also gratified to see many opportunities to enhance soils and crop yields. Nutrient availability, soil compaction, and a lack of biological functioning is very common on the intensively farmed lands.The picture below shows wheat roots being severely restricted to the surface layer due to compaction from puddling or other mechanical soil disturbances.You can imagine that when roots are allowed to explore deeper soil horizons they can access water and nutrients from a much larger soil volume. In fact, the poor nutrient status of many Indian soils may in part be explained by high nutrient extractions from the surface layer only. Example: Root growth severely restricted due to soil compaction. Research at various institutions, especially the BISA stations have demonstrated that better soil management can have great impact on crop productivity (see picture below). Using reduced tillage, better rotations, and timely seeding and transplanting can considerably enhance the productive capacity of the soil. Still, we found that plow pans (a compacted layer at around 10-15 cm) was a very common problem that limited soil productivity. We are exploring ways to better assess this problem and promote effective management practices to overcome it. 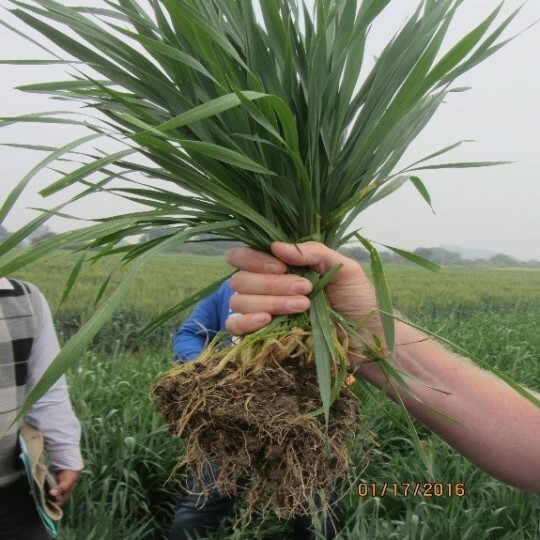 Example of what healthy soils and management can do: well-developed roots and a productive crop. Location: BISA farm site. Our next project efforts will focus on establishing soil health laboratories with our partners, and perform more comprehensive assessment of the health status of soils in the project region. This will also include a geospatial component that will help us understand the geographic distribution of the soils and their health. From this, we can establish better soil health management guidelines. We are also exploring the potential utility of a “lab-in-a-box” that would allow consultants and extension agents to perform basic soil health assessments in the field, with farmers present. This provides both a soil analysis, and an opportunity to educate the farmer community on soil health. 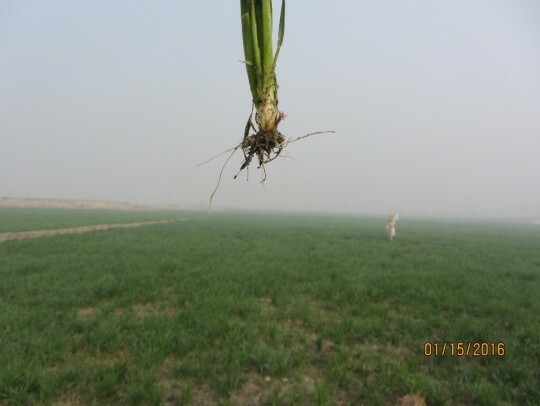 This direct connection is very important, as many Indian farmers are disappointed that they often do not receive the results from their soil analyses. In all, this project is off to an excellent start. We are able to build on the momentum that the Government of India is creating around soil health. We are offering a more holistic vision of soil health management, beyond the basic application of synthetic fertilizers. We have some great partners in this project who have also become enthusiastic about the broader soil health framework. The fact that even a large commercial fertilizer company sees opportunities around delivering services on soil health is most encouraging. Phil’s research is progressing rapidly, and we will hopefully be able to share important results soon.